Signed for St Albans City in the summer of 2007 after playing a leading role in Stevenage Boroughâ€™s successful bid for the FA Trophy. The most experienced member of the City squad who began his career as a trainee with Millwall, turning professional in 1993. Joined Sheffield United for Â£117,000 two years later and had two spells with Southend United either side of a stint with Kingstonian. Was appointed player/coach at Clarence Park having previously coached in Spain in 2006. 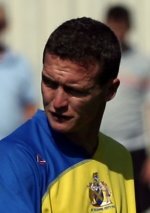 Left the club when Hanlon was sacked, joined AFC Wimbledon and publicly criticised the set up at St Albans, citing a lack of ambition.